Want to experience how is it to breath underwater? Want to become a certified diver? 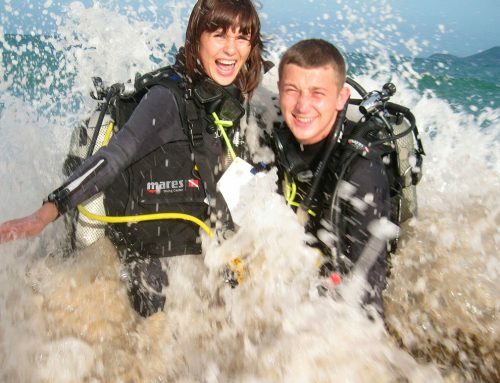 The PADI Open Water Diver course is the world’s most popular entry level in scuba diving. “Get your PADI” with us through this complete beginner training where you will get the knowledge, techniques and ocean practice needed to dive under professional supervision or with other certified divers. Enter a lifetime experience you won’t forget! To enroll into an Open Water Diver course (or Junior Open Water Diver) you must be 10 years old or older, in good physical health, and MUST be able to: complete a 200 meters continuous surface swim (or a 300 meters swim with fins, mask and snorkel) and a 10 minutes float test. Knowledge Development: in afternoon after the boat trip you would continue the theory and finish knowledge reviews, quizzes and exam. Open Water Dives 3 and 4: from our boat with your Instructor, two more ocean training dives to a maximum depth of 18 meters, repeating some more skills learned and exploring the reefs! You would then get certified to dive to a maximum depth of 18 meters anywhere, anytime! Not enough time to take this course? Check out the PADI Scuba Diver course! To learn more about PADI Open Water Course drop in to our Nha Tang PADI Dive Center located at The Sailing Club Vietnam on Tran Phu Street. Talk to any of our Sailing Club Divers staff about what dives and PADI Courses are available to you in Nha Trang.